This is a re-post of an article I wrote in 2012. I am re-posting it to demonstrate that recent stories about doctor shortages and wait times are absolutely inevitable results of government interventions in the health care economy. My son is in Freshman econ 101, and so I have been posting him some supply and demand curve examples. Here is one for health care. The question at hand: Does government regulation including Obamacare increase access to health care? Certainly it increases access to health care insurance, but does it increase access to actual doctors? We will look at three major interventions. The first and oldest is the imposition of strong, time-consuming, and costly professional licensing requirements for doctors. At this point we are not arguing whether this is a good or bad thing, just portraying its inevitable effects on the supply and demand for doctors. I don't think this requires much discussion. For any given price for doctor services, the quantity of doctor hours available is certainly going to increase as the barriers to entry to the profession are raised. The second intervention is actually a set of interventions, the range of interventions that have encouraged single-payer low-deductible health insurance and have provided subsidies for this insurance. These interventions include historic tax preferences for employer-paid employee health insurance, Medicare, Medicaid, the subsidies in Obamacare as well as the rules in Obamacare that discourage high-deductible policies and require that everyone buy insurance rather than pay as they go. 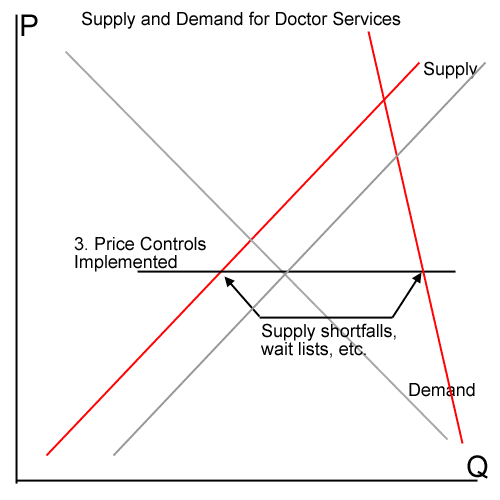 The result is a shift in the demand curve to the right, along with a shift to a more vertical demand curve (meaning people are more price-insensitive, since a third-party is paying). As the government pays more and more of the health care bills, this price rise leads to unsustainably high spending levels, so the government institutes price controls. Medicare has price controls (the famous "doc fix" is related to these) and Obamacare promises many more. This leads to huge doctor shortages, queues, waiting lists, etc. Exactly what we see in other state-run health care systems. The graph below posits a price cap that forces prices back to the free market rate. So, is this better access to health care? 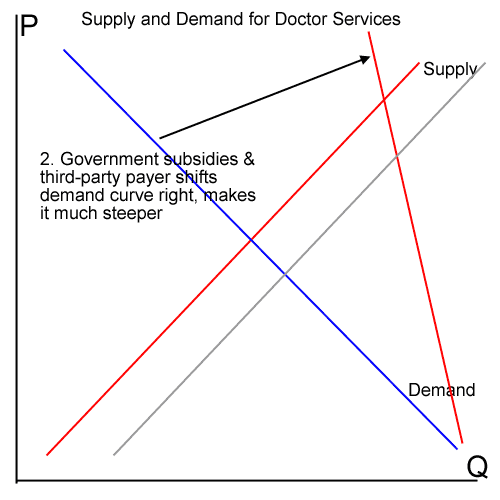 I know that Obamacare proponents claim that top-down government operation is going to reap all kinds of savings, thus shifting the supply curve to the right. Since this has pretty much never happened in the whole history of government operations, I discount the claim. When pressed for specifics, the ideas typically boil down to price or demand controls. Price controls we discussed. Demand controls are of the sort like "you can't get a transplant if you are over 70" or "we won't approve cancer treatments that only promise a year more life." Most of these do not affect the chart above, since it is for doctor services and most of these cost control ideas are usually doctor intensive - more doctor time to have fewer tests, operations, drugs. But even if we expanded the viewpoint to be for all health care, it is yet to be demonstrated that the American public will even accept these restrictions. The very first one out of the box, a proposal to have fewer mamographies for women under a certain age, was abandoned in a firestorm of opposition from women's groups. In all likelihood, there will be some mish-mash of demand restrictions, determined less by science and by who (users and providers) have the best lobbying organizations. 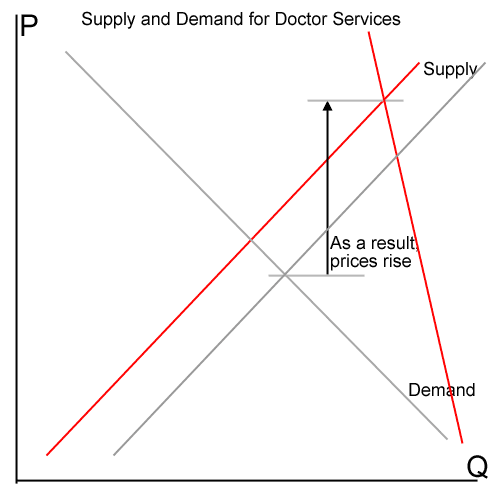 Update: Pondering on this, it may be that professional licensing also makes the supply curve steeper. It depends on how doctors think about sunk cost. "For any given price for doctor services, the quantity of doctor hours available is certainly going to increase as the barriers to entry to the profession are raised." You mean *decrease*?
" 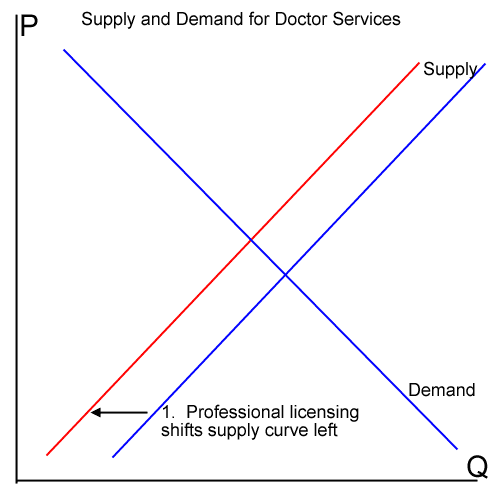 Pondering on this, it may be that professional licensing also makes the supply curve steeper. It depends on how doctors think about sunk cost." Steeper or shallower with a higher starting price? I think the latter. Sorta like you do with the demand curve where the top meets about the same point while the intercept is much higher up the P axis. You're seeing an affect like this already in the market, a larger use of nurses and physician assistants during routine and emergency care. Granted that Econ 101 level supply and demand graphs don't have the definitive prediction power that a set of equations governing the working pressure of a boiler have. But, to borrow a favorite engineering phrase, "Close enough for all practical purposes". Meaning: I take those Coyote curves as sufficient warrant to conclude people imposing Obamacare either (pick one or a combination): 1) Have zero understanding of what they have chosen to do; 2) Refuse and deride counsel that questions their belief system; 3) Intend results other than those they present, namely a) harm to specific groups b) seizure of control. Corollary: there are not other valid conclusions. ain't no such thing as a free lunch). As I scan the comments at a variety of media essays covering some aspect of Obamacare, 2) nearly always stands out. Belief in a free lunch that nobody anywhere has to pay for runs between the lines of even those comments that have a semblance of reason. Or, if that lunch isn't free, then it is morally right to use government force (which one can trust) to make somebody other than the eater pay for the lunch. smarties went into medicine instead of web/app development? regulating the number of hospital beds for many decades because they know that more beds = more Medicaid billings. So, if you have money to burn and are feeling altruistic you can’t just go and open up a hospital, that’s not how it works. It’s number 3. They intend results other than the ones they claim. This is called “unintended consequences” even when they are known to be likely because they were intended. With Obamacare, control over more of the economy and the wealth and power that will inure to the political class is what’s intended. If you have a place on the death panel determining who lives and who dies, you’re not just playing God, you are God. Or maybe the devil. Yes! I was also scratching my head on that. It seems that Obamacare will not discourage high-deductible insurance policies but will in fact encourage them. At least that’s what seems to be happening now. But this may be offset by an increase in subsidies for people who can’t afford both the new higher premiums and the new higher deductible insurance policies. "In all likelihood, there will be some mish-mash of demand restrictions, determined less by science and by who (users and providers) have the best lobbying organizations." The Senate is beginning debate on a constitutional amendment to modify the First Amendment. Specifically, the supporters of this amendment want to restrict the spending of money in election campaigns. Given how our system of government works, could it be unreasonable to think that future Congresses could interpret such an amendment (if adopted) in a way that would restrict how money is spent in lobbying Congress? Mexico is a good example of decent medical care. I have lived here since 1988 and even before that, flew here from PA for non-emergency treatments and dental-care (& free vacation!). There are LOTS of doctors here; so many that most of my doctor-friends have side-line businesses, and thus COMPETITION brings very low prices. I pay $23/month for govt. health insurance that has NO deductibles, but I still often go to private doctors and clinics because they are so cheap ($2 a visit at "Dr. Simi's clinics). All lab-work and most medicines require no prescriptions. Nobody I know has regular insurance because it is not needed. Get govt OUT of healthcare and let the free market work; that's the answer, USA. A fairly good paper but more study of the health care industry is needed. The health care crisis didn't start 30 years ago but rather 48 years ago. The cause is simply supply and demand. Demand created by Medicare and Medicaid outstripped the restricted supply of doctors and hospitals. Third party insurance (begun in the 1930s) was never the problem on the demand side. Licensing (started more than 100 years ago) is not the direct problem on the supply side, but rather states have been subsidizing the education of the number of medical school applicants recommended by the AMA. The supply of hospitals is restricted by CON. Poor countries are not good comparisons due to much lower demand. Better examples are in Continental Western Europe that have 40% more doctors than the US.